It will hardly come as a surprise but today’s match between Liverpool and Blackpool has been called off. Newly-promoted Blackpool don’t have undersoil heating at their Bloomfield Road ground and with records being broken in the North West of England for freezing temperatures there’s no guarantee the game would have gone ahead if they had. The weather station at Crosby, just north of Liverpool, saw temperatures drop as low as -17.6° C, the lowest it had ever recorded. Blackpool is less than 30 miles north of Liverpool. A noon pitch inspection had been planned, with questions asked as to why it wasn’t taking place at 9am to give Liverpool fans fair warning about whether or not they would need to travel. At a time when the advice given to the public is to avoid making any unnecessary journeys the late pitch inspection meant journeys would have started before it was known if it was a wasted trip. Shortly after his pitch inspection came the announcement from Blackpool: “The Seasiders Boxing Day fixture with Liverpool has been postponed due to a frozen pitch. The Red’s next league game will now be on Wednesday night at Anfield against Wolves. With last Saturday’s home game against Fulham also called off – the pitch was playable but there were health and safety concerns due to the snow and ice outside the ground – Liverpool will have gone 18 days without a league fixture. 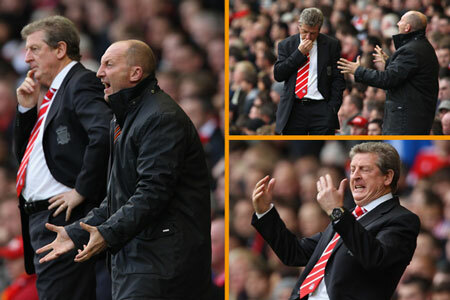 That last game for the Reds was that embarrassing 3-1 defeat to Newcastle United, the second newly-promoted side to beat Liverpool in what has been an awful season for Roy Hodgson as Liverpool’s new manager. Blackpool of course were the first, Ian Holloway’s side beating the Reds at Anfield in the last game under the ownership of Tom Hicks and George Gillett. The rearranged date falls in between Liverpool’s trip to Old Trafford for the FA Cup 3rd round clash with Manchester United and the home league derby with Everton, meaning Liverpool will face three sides in seven days that have already beaten them under Roy Hodgson’s management this season. 3 “big” games in 7 days with a manager who does not belive in “rotation” in the modern game is important. And a guy who likes to play “favorites” in most games until it was blatantly obvious some of the favorites are not up to scratch. I mean lets be honest, Torres has been protected too much. He needs to be dropped like any other player. And in that scenario If we drop him and he wants to go so be it. Your not commited enough if it is the case. In the other scenario he gets down and works hard to get back to where he was before the World Cup than great you will be cherished like any other Red and ex-Red. If I were in this position I would leave because its an unfair non-performance based selection. I mean even last season Babel played more than he did this season. This is what I mean by playing “favorites” and other “lower” players see this. But at this point of time we need a united squad of “best”, “good” and “lower” players working togather and not worrying about favorites. I’m sure alot of people on here would like to see, Kelly, Pacheco and Sheveley given a shot. Mainly Kelly to replace Johnson and Pacheco given a chance ahead of J.Cole. We are already way off pace so it makes no difference whatsoever if we play them or not. Because if they do well, We benefit from thier rise and climb up the table. If they don’t we drop them and they wait for thier chance and stick to the “senior” players. Or do we carry on now and play the “seniors” who are clearly not as commited and not climb up the table like what happened to Newcastle not so long ago and get relegated? We all have to make noise and decide what to do and make the manager hear it or the owners who clearly know little of football, Hear what the realities of percieved realities are.